Well, I thought I was well organized. But as it turned out, the cheeses I had found for you in the utmost east of Poland hadn’t made it to Berlin in time, and so we concentrated on Greece, with a look to Romania and Turkey. We started with several kinds of Feta (of which each of 11 million Greeks consumes 12 kg per year) and white cheese, including a very fine goat’s milk one from Istanbul, all pairing happily with the Roditis from Mercouri from the Peloponnes. The Romanian Branza de Burduf demonstrated how the rind of pine trees influences the aroma of sheep’s milk curd matured in it. It was a kind of Retsina in form of cheese most of you liked a lot. In the glass it met with the wonderfully minerally salty lemony Assyrtiko from Avantis on Santorini – which paired surprisingly well with the 12 months old sheep’s milk Graviera. 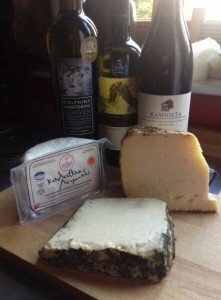 We concluded with the characterful Ramnista Xinomavro from Kir-Yianni in Naoussa in northern Greece, with two mature cheeses from Lesbos (many thanks to Christos Tziolis from the highly recommended Greek wine store Cava in Berlin for the wines and these cheeses!) – and I sent you off with a teaser taster of Turkish Tulum (of which there’ll be more at the big Turkey HeinzelCheeseTalk Special during the Cheese Berlin)… I’ll save and share those Polish cheeses with you asap, promised! HeinzelCheeseTalks take place regularly, usually on a Friday at 6pm at Markthalle Neun in Berlin-Kreuzberg. I bring some interesting cheese, open a few bottles of wine, and we sit around the large table opposite the Suff wine stall, tasting, drinking, talking, discussing (mostly in German – but we usually manage to cater to English speakers too). Invites are sent out about ten days before we meet, to a mailing list you can join here. Reservations need to be confirmed and are strictly by first come first serve – so be quick! And please do let me know if you can’t make it – there is always a waiting list. A donation of ten euros per person (or one or two euros more if you really had a lot of fun…) is much appreciated. Cheesio!